The Swimming Pigs in the Bahamas are the most sought after excursion in the world right now! These swimming pigs Bahamas are now a famous landmark of the Bahamas Out Islands. 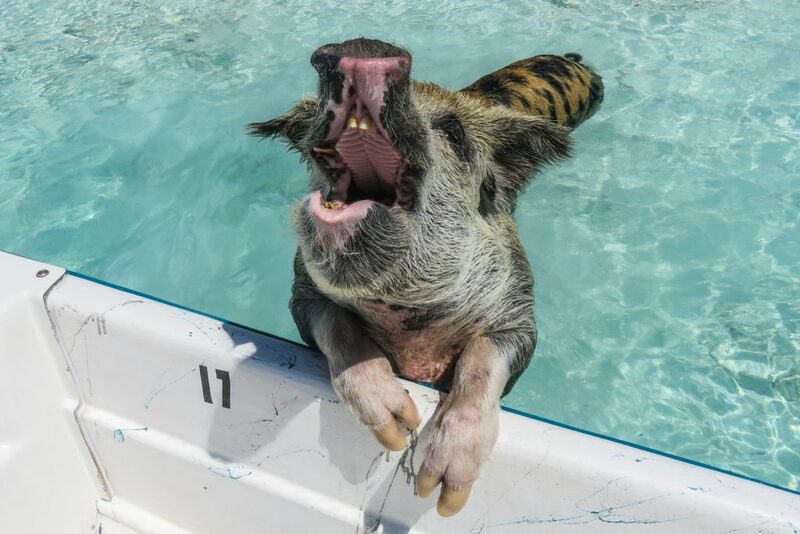 So, how do you go about visiting the Swimming Pigs in the Bahamas and where can you book onto a Bahamas Pigs Tour? 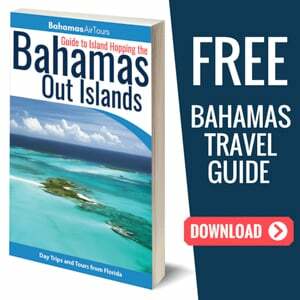 Having travelled extensively across the Bahamas Out Islands I’m here to give you the ultimate expert guide to swimming with pigs Bahamas including all the details of arranging a day trip from Nassau or Florida. Firstly, there are actually 2 locations you can visit the swimming pigs Bahamas. These are at Pig Beach (Big Major Cay) on Exuma Island or at Piggyville (No-Name Cay) on Abaco Island. 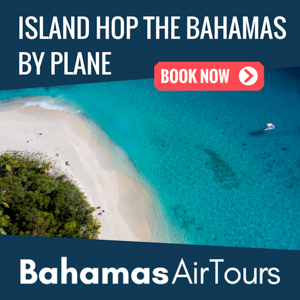 Both locations are equi-distant (30 minute flights), from Nassau the capital of the Bahamas and transportation hub for travellers by air or sea. Both locations can be visited in a day by day trip from Nassau. And both can be visited direct from Florida, on an island hopping tour or day trip, with Bahamas Air Tours. For day trips from Nassau to Pig Beach book the Nassau to Exuma Day Trip! It’s not just about the Pigs! Each of these two swimming pigs locations also have their own unique scenery, wildlife and areas of interest to visit too! If you visit the Exuma Pigs at Staniel Cay you can also visit the Bahamas Rock Iguanas and the James Bond Thunderball Grotto. On Abaco you can snorkel with Turtles, feed stingrays and sharks. Pig Beach is located on the small island of Big Major Cay, which is located within the Exuma Cays. The Exuma Cays are a collection of mostly uninhabited tropical islands set amongst the most beautiful turquoise water you will ever see on earth! Staniel Cay is the nearest settlement and has it’s own airport, although it can only handle small planes. It’s really just an Airstrip. A destination in it’s own right, Staniel Cay is home to a few small boutique hotels, a marina for luxury yachts and the small airstrip. The Exuma Pigs, as they are known here on Big Major Cay, are the most famous of all the swimming pigs Bahamas. Stories about how these pigs arrived here vary. Some say the Exuma Pigs were shipwrecked here and miraculously made their way onto the shore at Pig Beach Bahamas. Others have suggested sailors left the Exuma Pigs here with the intentions of returning at a later date, but never returned. The real reason of their origins is in fact far simpler. Local villagers from Staniel Cay kept the pigs here instead of around their homes to avoid the bad smells! Unfortunately as the Exuma Pigs have become famous in recent years, this has brought about a negative impact to their welfare. At the start of 2017 many of the Exuma Pigs were found dead and locals presumed they were being fed the wrong type of foods, or even alcohol and beer by tourists. 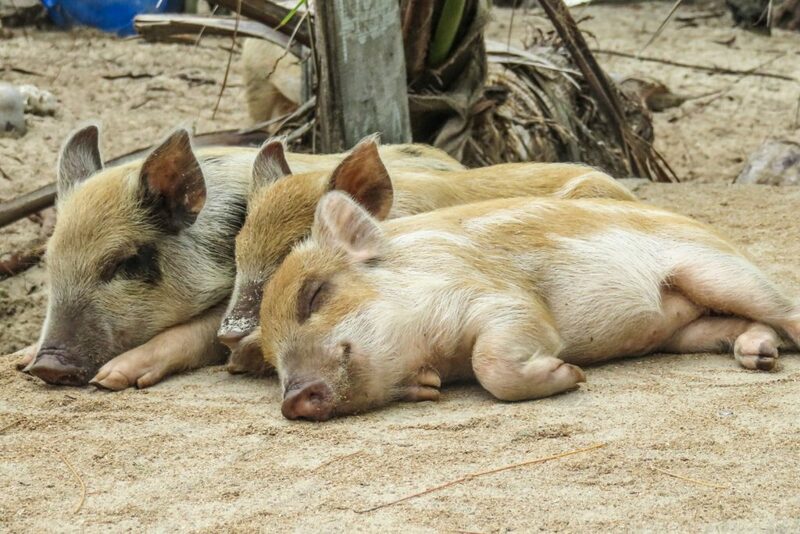 Further to that, there were allegations of theft, as one tour operator was alleged to have stolen piglets from Pig Beach Bahamas to relocate them to Great Exuma for tourists staying in Georgetown. 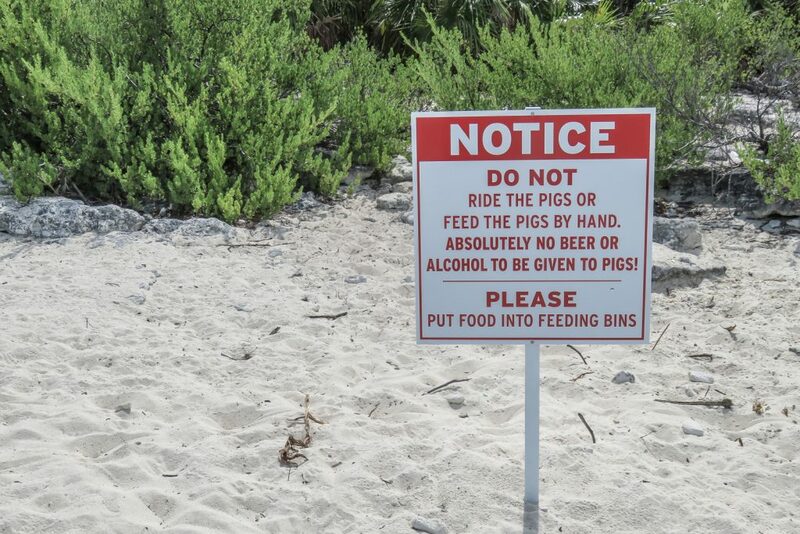 Prominent signs are now visible across Pig Beach to warn tourists and tour operators about the dangers of getting too close to the Exuma Pigs. The Exuma Pigs are wild animals and mostly survive off scavenging for food, but now they pretty much rely on the steady stream of tourists coming to visit and feeding them. A covered shelter on the beach at Big Major Cay contains drinking water tanks to provide a safe drinking water source for them. 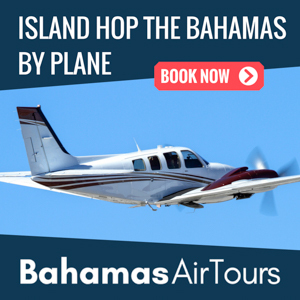 Bahamas Air Tours, offers the World’s first trips from Florida direct to the Exuma Pigs. 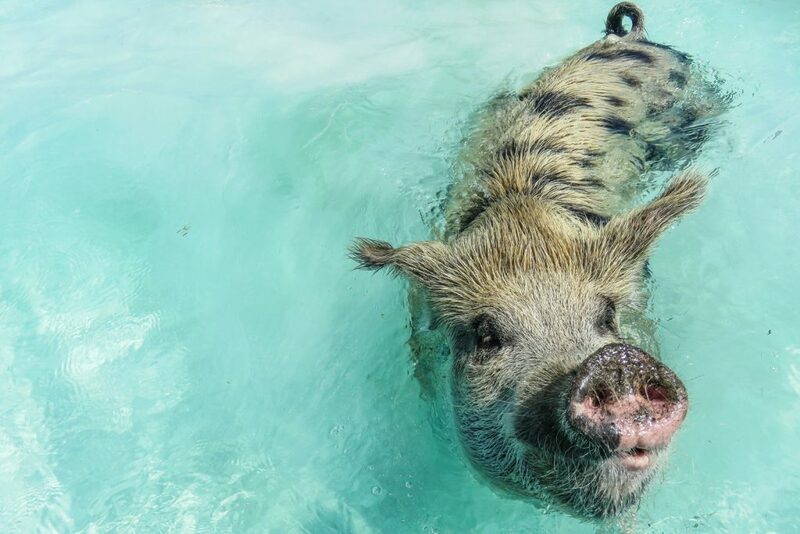 They provide a variety of Day Trips and multi-day Island Hopping Tours from airports across Southern Florida to visit these amazing pigs in the Bahamas. 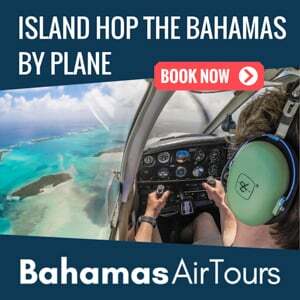 As well as their tours and bespoke itineraries, Bahamas Air Tours, provides FAA certified private air charter flights to Bahamas. Their most popular tour to the Bahamas Swimming Pigs is the Miami to Bahamas Day Tour by Plane. 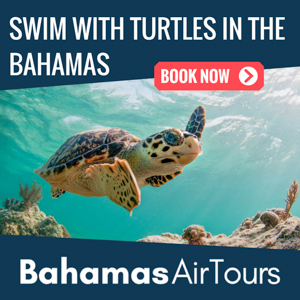 As a whole Tour Package, Bahamas Air Tours arranges all the Flights, Hotels and Tours for you trip, to ensure you have the ultimate Bahamas Vacation. 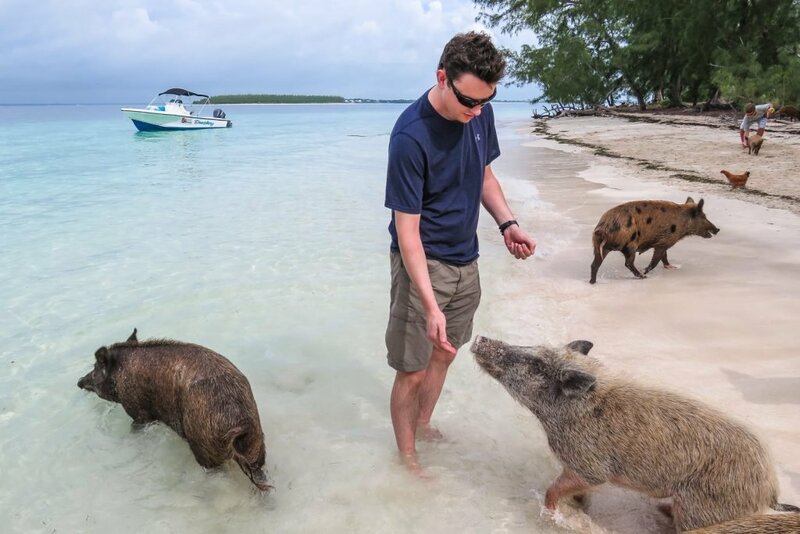 From landing in Staniel Cay on either their Day Trip or Island Hopping Tours, you’ll be whisked away on a boat excursion of Staniel cay with an expert local guide, taking you to visit the Exuma Pigs at Pig Beach Bahamas. 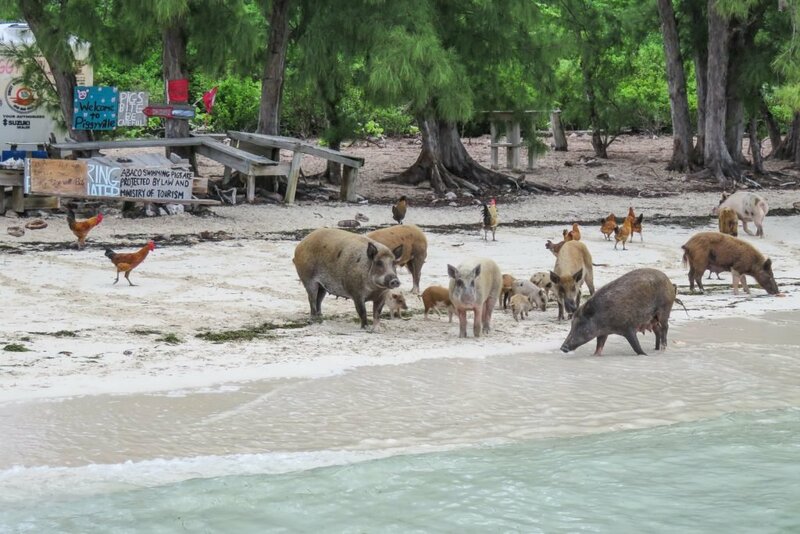 The only way to get to Pig Beach at Big Major Cay is by boat. You can either join an organised boat tour or charter your own boat to visit the Exuma Pigs from Staniel Cay. There are a number of independent boat operators based at Staniel Cay who offer tours with guides. The Staniel Cay Yacht Club also offers boat/skiff hire at reasonable rates per the hour. To just visit the Exuma Pigs you only need around 1 hour to make the journey from Staniel Cay to Pig Beach. To visit everything at Staniel Cay from the Iguanas at Bitter Guana Cay to the Sharks at Compass Cay you need around 5 hours. Can you Day Trip the Exuma Pigs from Nassau? The answer is Yes! There are two choices you have to get to Pig Beach, by Sea or Air. A number of tour operators in Nassau offer a day trip boat excursion to the Exuma Pigs, but beware: It’s a 2-3 hour ride, by Speedboat and they all use a zodiac inflatable rib type boat, which offers no protection from the sun or wind; it’s a wild and slightly uncomfortable ride with some operators limiting the minimum age of passengers to 12. The far better choice, in our opinion, is to fly from Nassau to Staniel Cay. You can take a Staniel Cay Day Trip excursion or arrange for a private Air Charter from operators like Bahamas Air Tours. it’s only a 30 minute Plane ride, then once you land in Staniel Cay, you can join a private boat tour with a guide or charter your own speed boat. The boat tours from Staniel Cay cost in the region of $200-$300 USD per person, and if you want to visit the Sharks at Compass Cay, there is an extra $10 fee there. 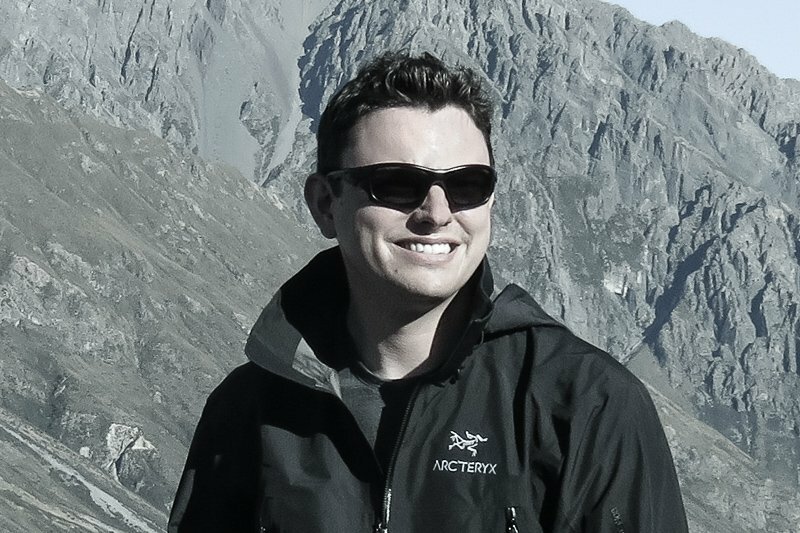 My advice; Book a private Air Charter which you can arrange to fit your own schedule. 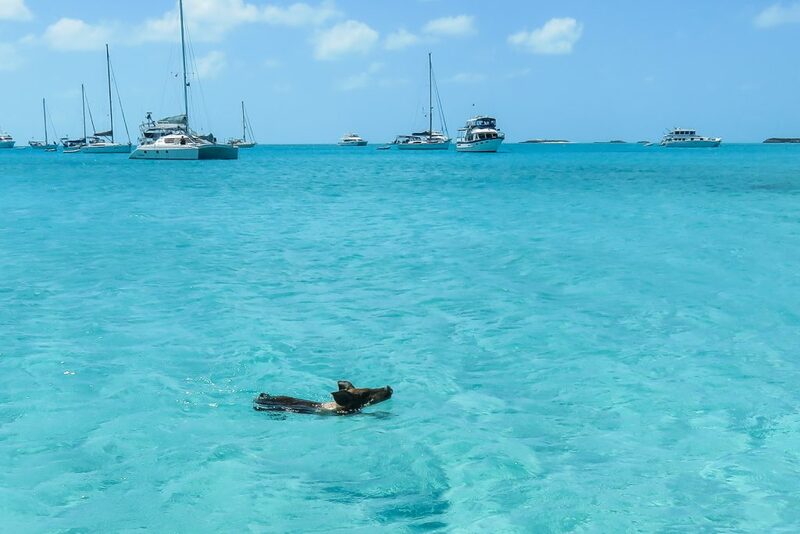 Perhaps relatively unknown in the Bahamas, are the less famous but more adorable swimming pigs at No-Name Cay on the the Abacos Islands. The Abacos Islands are the furthest north of the Bahamas Out Islands, which benefits North American visitors as this is one of the closest islands to Florida. The pigs at No-Name Cay live at “Piggyville”, a small beach nicknamed after these swimming pigs. When I visited Piggyvile at No-Name Cay, there was a much larger gathering of pigs living there compared to at Staniel Cay, which was slightly surprising. Living alongside the pigs at Piggyville were chickens too. Craig Russel, a local, nicknamed the “Pig Whisperer” frequently visits the pigs here to look after their welfare. And also impressive is the way local businesses have grouped together to help provide further support to these swimming pigs. 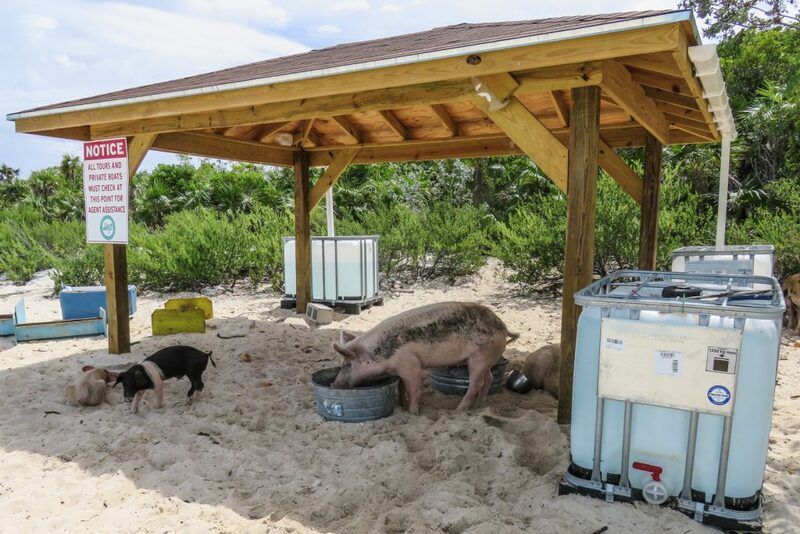 Sunset Marine and Boat Rentals have installed a high capacity 2,000 gallon water tank which ensures a continuous supply of fresh drinking water to the swimming pigs. The water tank is fitted with nozzles, similar to those found on Pig farms which allow the pigs to drink from the tank. A trough collects any waster water. Sunset Marine and Boat Rentals visit the pigs frequently and ensure the water tank is replenished. 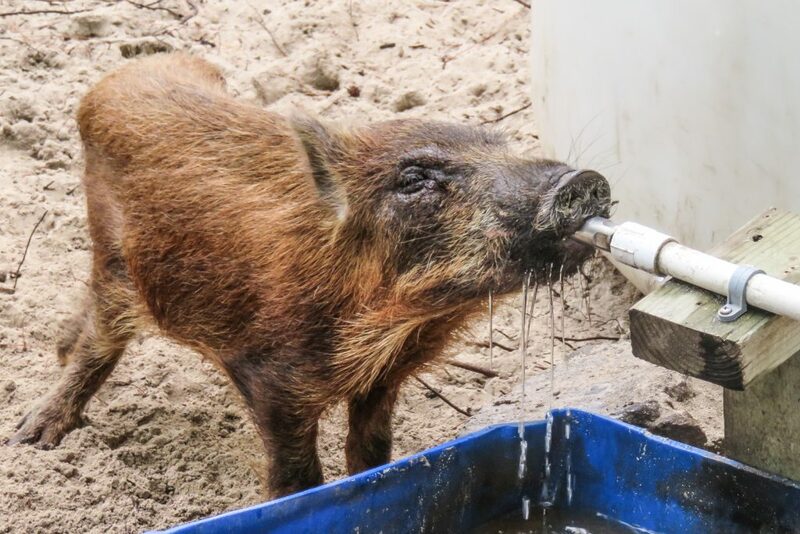 It’s an important consideration for the pigs here, a drinkable water source, as there aren’t any naturally occurring sources on No-Name Cay. You can feed the pigs here, just be careful as Pigs Bite! The Swimming Pigs enjoy leftover foods; vegetables, fruit, bread etc. Place the food in the palm of your hand and keep you hand open, then let the pigs eat your food! 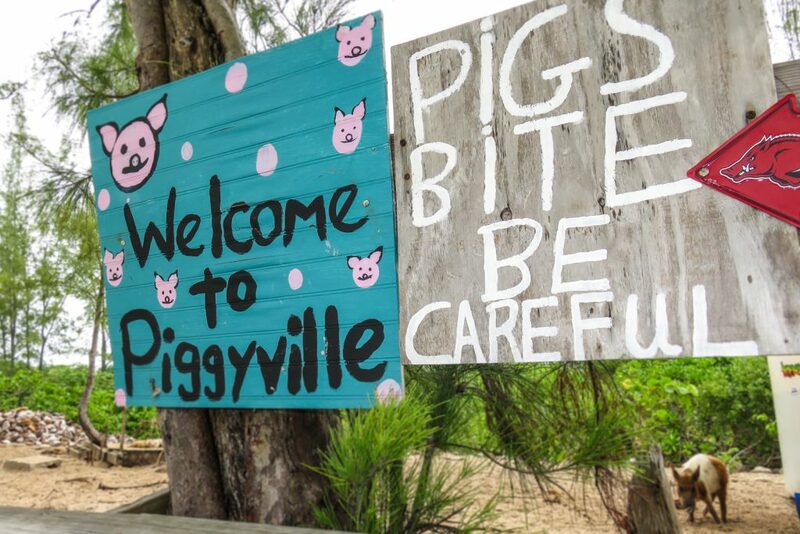 The pigs at No-name Cay are certainly one of the Bahamas hidden secrets, and no big tour groups visit here so it’s likely you’ll have the pigs to yourself when you visit Piggyville. Besides the pigs at No-Name Cay, the abacos has so much more exotic wildlife for you to visit. Just next door is Green Turtle Cay where you can go swimming with Green Turtles and feed Sharks and Stingrays. Adorned with stunning white sand beaches, Green Turtle Cay is a brilliant Bahamas Vacation destination choice. Served by flights to Treasure Cay Airport from Florida and Nassau, its a relatively well connected out island of the Bahamas. 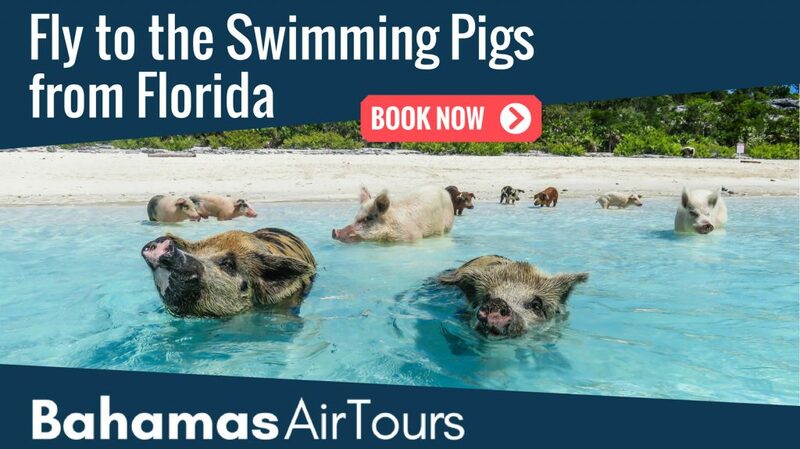 Bahamas Air Tours, offers the World’s first trips from Florida direct to the Pigs at No-Name Cay. 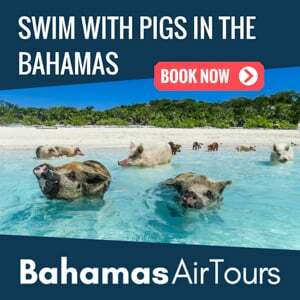 They provide a variety of Day Trips and multi-day Island Hopping Tours from airports across Southern Florida to visit these amazing pigs in the Bahamas. 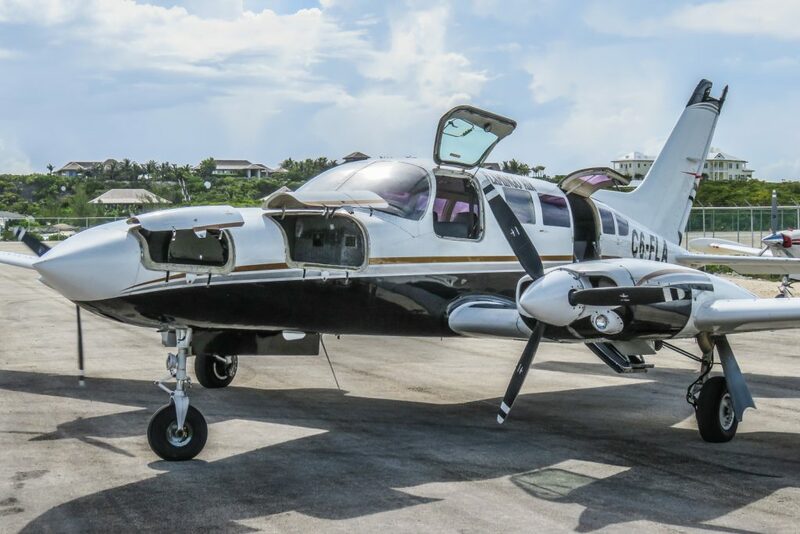 As well as their tours and bespoke itineraries, Bahamas Air Tours, provides FAA certified private air charter flights to Bahamas. Their unique day trips to Green Turtle Cay include a boat excursion that visits the swimming pigs, green turtles, Nurse sharks and Stingrays. 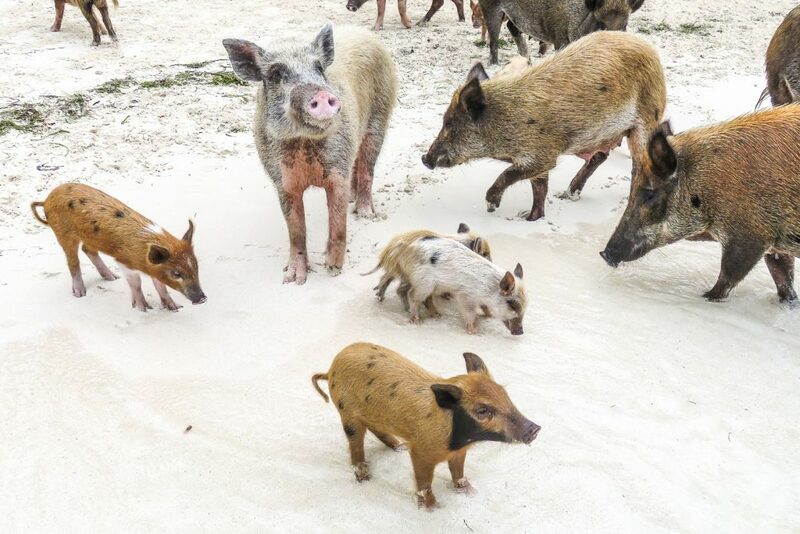 It’s certainly possible to visit the Pigs at No-Name cay as a day trip from Nassau. I did it myself and this is how I achieved it. The first important point to note is that the Pigs at No-Name Cay are accessed by Boat, and the boats depart from the Green Turtle Dock at Treasure Cay. The dock happens to be conveniently close to the Treasure Cay Airport, so your best bet is to get flights to Treasure Cay. 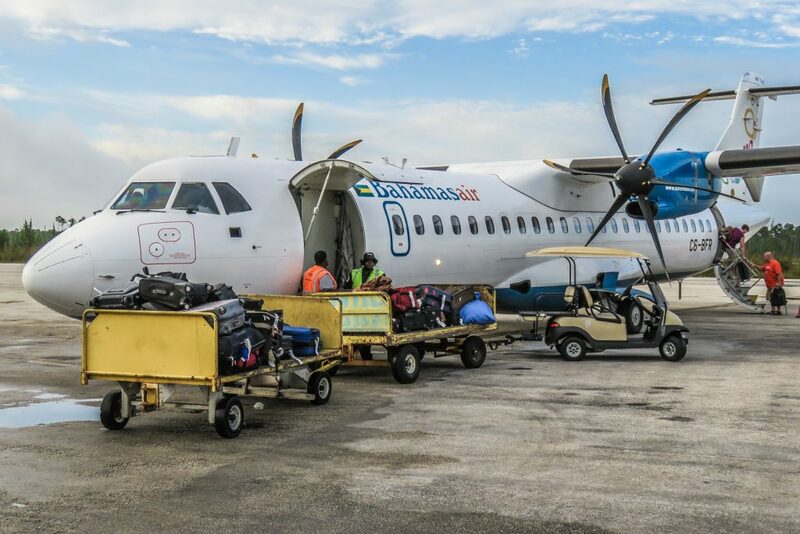 The first problem with that plan is there are only a handful of flights which go from Nassau to Treasure Cay Airport and none which go early in the morning and returning in the afternoon to allow a day trip. The best option for flying to Treasure Cay Airport is to book a private air charter from Nassau. However, I flew from Nassau to Marsh Harbour. 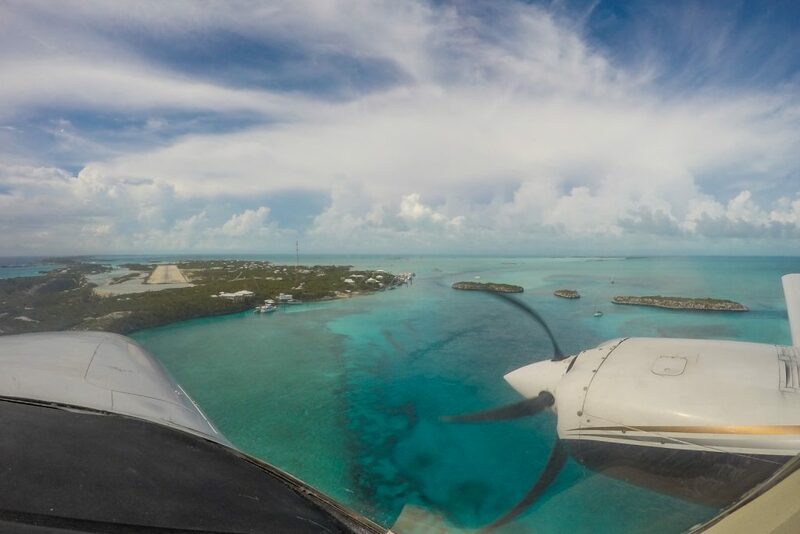 Bahamas Air has an early morning flight and an early evening return flight, allowing a full day on the Abacos. Marsh Harbour airport is a 30 minute drive to the Green Turtle dock for boat excursions to the swimming pigs. You can take either a taxi ($75USD one way) or hire a rental car ($80USD for the day). The rental car option is much better value than taking a private taxi. You can park the hire car in the car park at the Green Turtle dock and begin your swimming pigs tour from there. At the time of writing there were no boat excursion day trips direct from Nassau to No-Name Cay or Treasure Cay, so for now the only way is to fly. 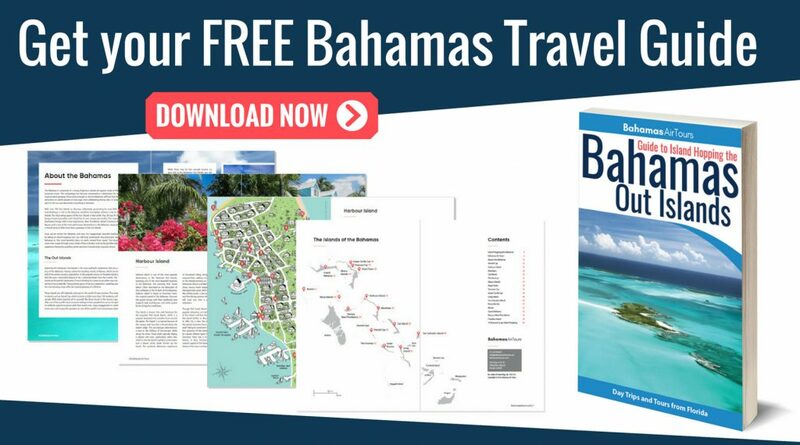 This would a good read and I am sure it will provide much-needed info to persons looking to fly to these places but I would like to say, as a Bahamian myself and also have much knowledge and experience with traveling to all outer islands that a statement you wrote is not correct. There are a few boat tours that indeed have solid fiberglass built hulls that are indeed power boats that are NOT inflatable and DO have protection from the sun on almost the entire boat such as, Powerboat Adventures or Island World Charters. Even the inflatable boats get there in under 2 hours depending on the weather of course. These tours take kids from 2 years old as well and take under 2 hours to get to Staniel Cay. Please take time to research better as these businesses take time and effort to do what they do, certainly not to be bashed like so when compared to taking a plane ride. Hi Alaura, Thank you for your time to comment. We ensure the highest standards of research in all our articles. I have to strongly disagree with your statement, because none of those powerboat operators you have mentioned offer excursion trips to the Swimming Pigs at Staniel Cay – this is the focus of the article. 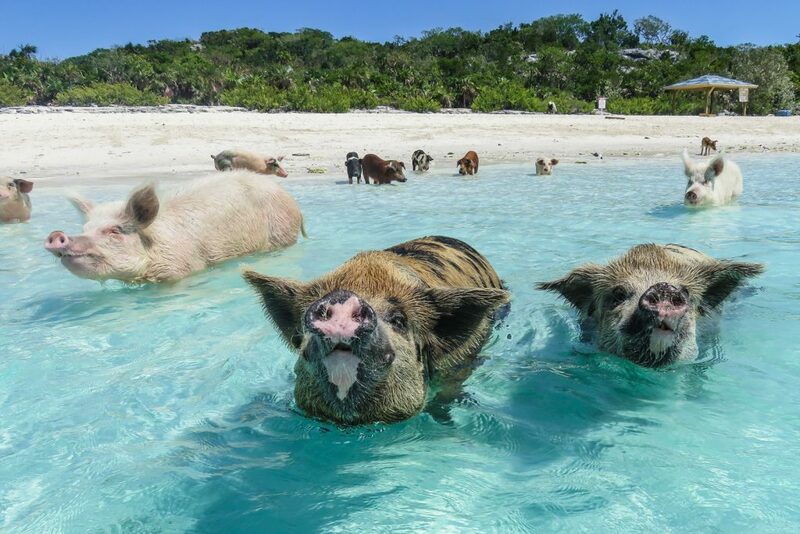 They may well offer boat tours to the Exumas, but crucially they don’t go to the Swimming Pigs. I will be visiting Naussau Bahamas on September 21, 2018 on a cruise with Carnival Cruise lines. 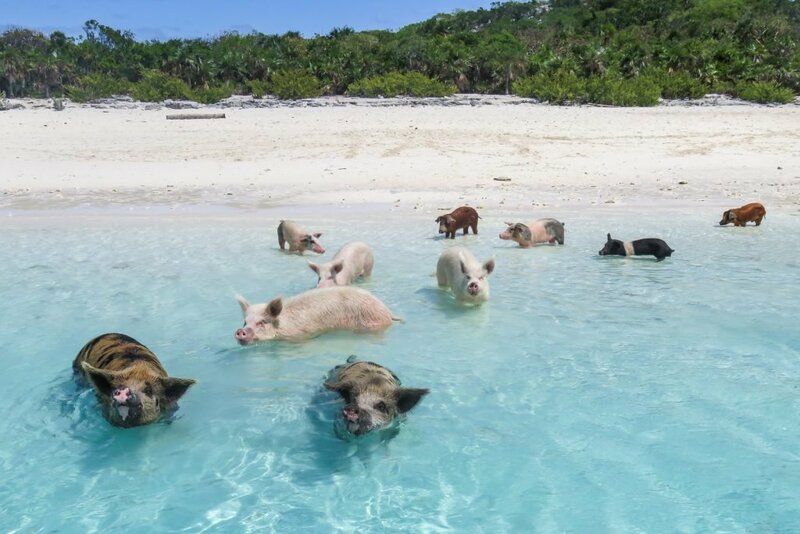 I would like to visit Pig beach for an excursion for the day. Considering that I will be on limited time. I would need to Charter a flight to that area. I have to be back to the cruise ship by 4:00 PM. I believe we can exit the ship at 9:00 AM that morning. It is only 2 of us in my party. I am wondering how many people is needed to Charter a flight and how much does it cost to Charter a flight? -or–and- Is there any other way to get to Pig beach? Boat?